Jane Reynolds, 85, of Bowersville, passed away on Saturday November 17, 2018 at Hospice of Dayton. Born September 18, 1933, in Springfield, the daughter of Ralph and Hazel Lee Watson McCormick. Jane was preceded in death by her husband Robert “Bob” Reynolds on June 10, 2015; they were married November 18, 1950. She was a longtime member of The Bowersville Church of Christ, where she was a member of the ladies aid. Jane served her Lord by cleaning the church over 25 years, playing the piano and singing. 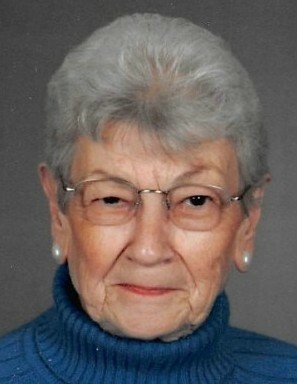 She was also a member of the Jamestown Senior Citizens, loved to bowl, work on crafts and word puzzles. She is survived by her children; Debra (Larry) Pauley and Diane Burns of Xenia, and Danny Reynolds of Springfield. Also left to cherish her memory are grandchildren: Nikki and Heath Penewit, Shane (Gig) Reynolds and Brianna Burns; great grandchildren: Lucas, Sophia and Micah; and a brother in law, Richard Reynolds. Visitation will be at the Bowersville Church of Christ on Wednesday from 10:30 a.m. until Noon, when the funeral service will begin. Burial will be in the Woodlawn Cemetery, Bowersville. Contributions are suggested to the Bowersville Church of Christ Ladies Aid. Littleton Funeral Home, Sabina, has been entrusted with arrangements.